In Wednesday’s parallel session Apportunity Knocks, Will Russell, Manager of Innovation and Technical Development at RSC Publishing provided an overview of their approach to develop mobile apps for their members. They started their mobile timeline in 2010 with Chemistry World (mark 1) following in the same year with Publishing Platform and ChemSpider mobile sites. In 2011 they launched RSCMobile, ChemSpider and Chemistry World (mark 2) mobile apps. They believe the future is multi-device so their aim is to be device independent. The mobile market is large and still growing with app usage time exceeding mobile website usage. In this landscape, browser-less discovery is key. They aim to keep customer needs at the heart of what they do. Chemistry World now has a full mobile app to respond to reader demand. They have optimised content for smaller handsets, but it is more like reading the magazine on a tablet. 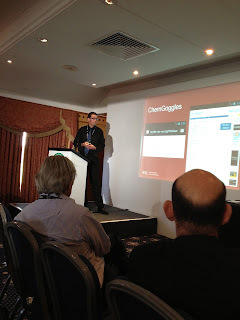 ChemSpider 2010 had a mobile optimised website but has now moved to the ChemSpider Mobile App. Why? Because of the mobility of scientists. Whether in a lab or at a seminar - you can put content in their hands. They have received great anecdotal feedback at conference: people speaking positively about ChemSpider because of the app. They keep the strategy and products under constant review. Developments to consider include APIs that will generate the most useful apps with your/our content and the use of information available free of charge to create apps such as UK Government Data. on-going future maintenance - more technologies than just a hosted website. how can you support others to build apps? we will never have such a long period with the same interface again - in two years we could be talking glasses in the mainstream. US businesses have worked hard in recent years to create visibility for themselves on the Internet and adapt to the needs of the online consumer. Great to know that other entities are helping them in making this event successful.